Poetry Friday is a commitment to weekly time for poetry, and teachers around the country have implemented that plan in their own way. 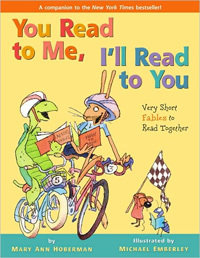 I first found out about the idea of Poetry Friday from Franki and Mary Lee over at A Year of Reading, as they post different poems every Friday, which are curated by a rotating collection of blogs (the full list of Poetry Friday round ups is available here at KidLitosphere Central). 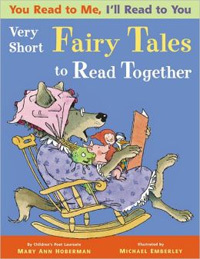 Just as I was making the commitment to implement Poetry Friday in my own classroom, I found out about the publication of The Poetry Friday Anthology by Sylvia Vardell and Janet Wong. (The Anthology even has its own web site: The Poetry Friday Anthology.) 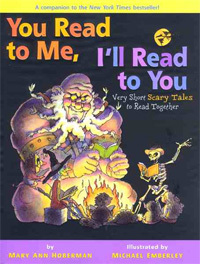 The Anthology contains a full school year's set of suggested poems (36) for each grade level K-5. (A second version of the Anthology is now available for 6-8th grades.) Each poem is accompanied by a "Take 5" of five suggestions for curricular links, connections, and performance tips. There are a great jumping off point for those wondering how to go about launching Poetry Friday, but you should not feel confined to sticking to these suggestions. In my third grade classroom, Poetry Friday happens as soon as our weekly spelling or grammar test has wrapped up and lasts around 20-25 minutes. We start by gathering on the rug to share a poem projected on the SmartBoard, so that we can all see and discuss it. I generally begin by reading the poem out loud, and then we spend a few quiet moments thinking and noticing things about the poem before we discuss it. Poems are chosen for a wide variety of reasons, and many link in to curriculum or concepts we have been studying. Our poetry discussions are wide-ranging and student-driven. We cover academic aspects of poetry like rhyme, meter, and literary devices, but we also spend time paying attention to words, images, and questions we have about the poem or the poet. Most of the poems that I choose early in the year are those without clear rhyme schemes or forms, so that we can delve deeply into the question of "What is Poetry?" and get away from the idea that all poems have to rhyme. The rest of the remaining time is for poetry exploration. Students are free to choose whether to read or write poetry, either individually or in small groups. 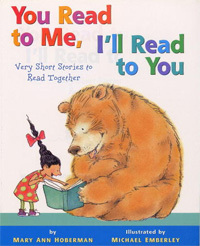 Mary Ann Hoberman's You Read to Me, I'll Read to You series of partner poems are perennial favorites, and you will often hear a joyful cacophony of characters and their distinct voices ringing out around the room. Students often choose to write their own poems either in their Writing Notebooks or, later on in the year, on the laptops. Last year's class in particular opened my eyes to the potential of PowerPoint for poetry - especially the use of different slides for each stanza. PowerPoint helped my students develop a much more immediate understanding of the use of line breaks and stanzas for meaning and dramatic emphasis. Even transitions and backgrounds were incorporated into the meaning of their poems (see Sam's poem, below). If we have enough time, we usually spend the last 3-5 minutes for sharing and presenting poems. Students often volunteer to share poems they have been writing or perform favorite poems by others. We began to have so much interest in sharing, that Poetry Friday soon overtook our normal end-of-day homeroom time. Now we rush to clean our lockers and pack our bags so that we can sneak in another 5-10 minutes of sharing poems as a group. Poetry Friday is a commitment to poetry. My students know that I love and value poetry, and they learn to love and value it as well. Poetry became a way for students to express themselves as well as to share and have fun with their friends and classmates. We learned to express appreciation for each other in a supportive community and even to offer advice and suggestions when a classmate presents an incomplete poem. From the squeaky voices of Ms. Muffet and the spider to a verbal duel between Opera and Disco written and performed by a pair of students, anything goes for Poetry Friday. By the time our poetry unit rolled around during writing time in January, students were in awe of the idea that we could spend every day with poetry. And when the end of that unit concluded with a Poetry Celebration and giant poetry slide show, we consoled ourselves that at least we still had Poetry Friday to look forward to each week. How do you celebrate and use poetry in your classroom? I love how you are using Poetry Friday in the classroom! Bravo! I don't teach, but was a former college music librarian, now a poet and writer. Thanks so much, BJ! It was such an easy addition and now it's one that I wouldn't do without. As a writer, it's great to hear about your students' experiences and that poetry is alive and well in your classroom. Thanks for the encouragement, Michelle! It's amazing what kids can do when you give them the opportunity to explore. You are too kind, Bridget. I think it is incredible what a diversity of poems that are available, so it is easy to find one that links to what you are doing. Plus I find it is more meaningful when students "discover" things in a poem on their own (like internal rhyme or meter or ... ) than if I just sit them down and tell them about it. So true about the diversity of poems! There is no other genre where you can present diversity in topic, style, and voice--in just 5 minutes. The use of PowerPoint for poetry - so interesting. And what a great poetry thing you've got going on in your classroom! Here's to a job well done! Thanks so much, Monica! As I hope Sam's example showed, they really embraced all that PowerPoint has to offer to make some unique creations. Glad to hear how you are bringing poetry into your classroom. Have you tried Haiku Deck with them for the presentations? Hi Donna, no, I haven't heard of Haiku Deck. I will have to check it out, thanks for the suggestion! Do you have any posts about how it has worked for you? Here are two I made using their images, but you can upload your own, or students' own images they want to use. And they don't have to be haiku - it can be any writing and any number of pages/slides. I retired before I could use this in the classroom, and I had first graders...however, I've done similar things with them using much older technology. This would seem to be something the kids would like and I would love to use with a class! See what you think. To begin with, try the Haiku Deck for poem presentations (it's online and free). If you have a camera or camera phone they would have a great time snapping images to go with their poetry presentation. Thanks so much for sharing these links, Donna! Great food for thought, and I love the photographs that you used to accompany your haiku. Lovely. I will definitely spend some more time investigating. Thanks for the lead! Thanks so much for stopping by and for the wonderful book, Janet! It is amazing to watch how motivated they are to get extra poetry time and how much they enjoy sharing and performing for their classmates. I will definitely check out the Science version, and I am excited about the upcoming "Celebrations" ones too! Oh wow! These are so fun, and I love the combinations of poems, art, and photographs. Thanks, Janet! So fun, Katie! I love your commitment and enthusiasm-- it's inspiring. And the name "Logonauts" is SO CLEVER! Thanks so much, Sylvia! Logonauts came out of a brainstorming session while planning a unit built around words and word roots - too hard to resist creating our own! And thank you so much for the inspiration that this book and Poetry Friday have been! Wonderful commitment to poetry that you have established in your classroom. I enjoyed the student poem on Light. Thank you so much, Carol! We really enjoy it, and I hope other teachers will be encouraged to do more of the same. And thanks for your poem comments - I know Sam will be excited to hear that you enjoyed his poem! Thank you so much for your comment, Buffy! Sam and I both appreciate it.